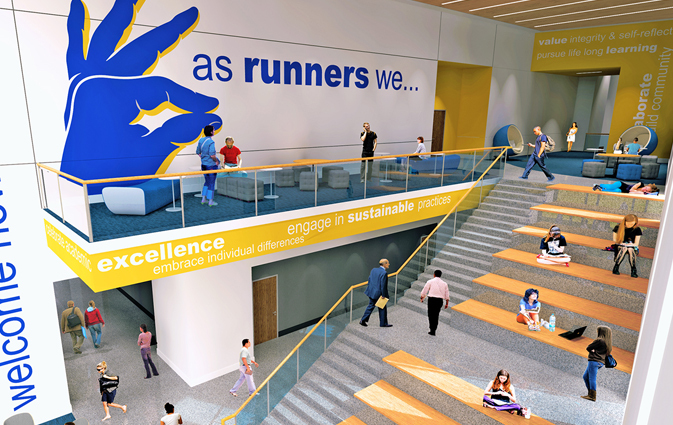 CSUB’s new Student Union, conceptual designs by TETER, is featured on The Bakersfield Californian. CSUB just keeps on growing. 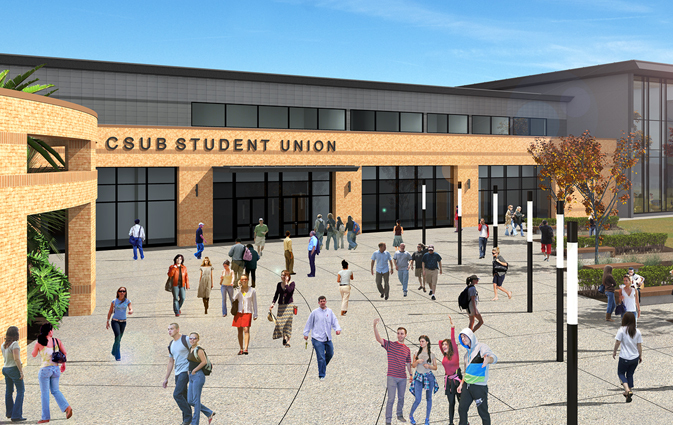 Students at the ever-expanding university have approved a $37 million expansion of the Student Union and a companion aquatic center, voting 61.4 percent to 38.6 percent in a two-day referendum that ended Friday. The tabulated results were announced Monday. Cal State Bakersfield will now move ahead with plans to more than triple the size of the Student Union and build a nearby aquatics facility. The announcement came from the university’s Associated Students Inc., which facilitated the vote. 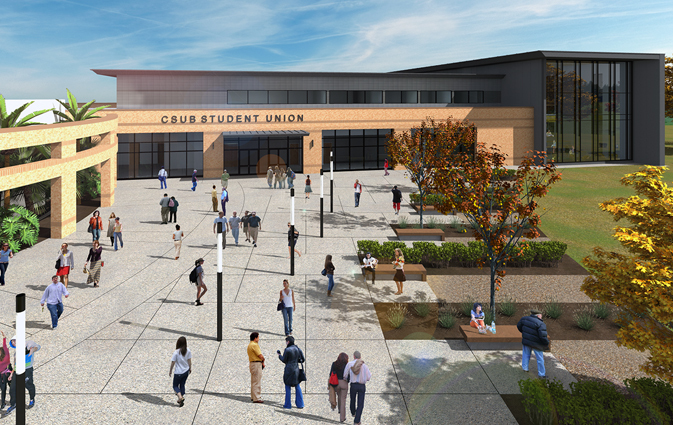 The expansion “will encourage student development, improve student life, provide exceptional services and advance the CSUB community,” ASI President Mariela Gomez said in a statement. 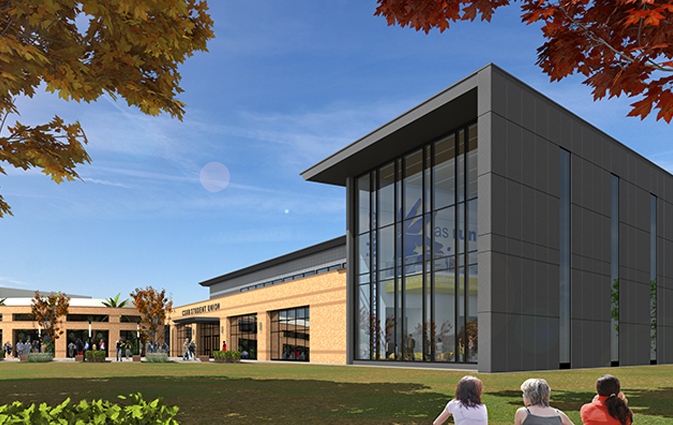 The 80,000-square-foot expansion will include about 40,000 for the two-story Student Union expansion and 40,000 for the new aquatics facility. The existing 17,000-square-foot Student Union was originally built in May 1987 when the campus population was about 5,100. Since then, CSUB has grown to about 11,000 students. The $37 million price tag includes $27 million for the Student Union and $10 million for the aquatics center. It will be funded through a combination of sources, including a $40-per-semester increase in student fees, tiering up after the first year to $160 per semester over a four-year period. Fees for the aquatic facility will be roughly $20 per semester and will not increase. “We currently have the reputation of being a commuter campus, but I see it becoming more of a metropolitan campus,” Gomez said. “We’re really thinking about the future. ASI leaders plan to meet soon with campus administrators to decide when the fee collection will begin. Students who currently receive financial aid will have all fees covered without any out-of-pocket expenses. University officials say it’ll take three years of fee collection before construction of the Student Union expansion can begin. Planning for the construction of the aquatic facility, which will be located on the dirt lot on Kroll Way across the street from parking lot K2 and next to the soccer field, will begin immediately. The timeline for completion is not yet set. – A loft feature lounge overlooking the first-floor lounge. Originally published in THE BAKERSFIELD CALIFORNIAN on February 26, 2018.